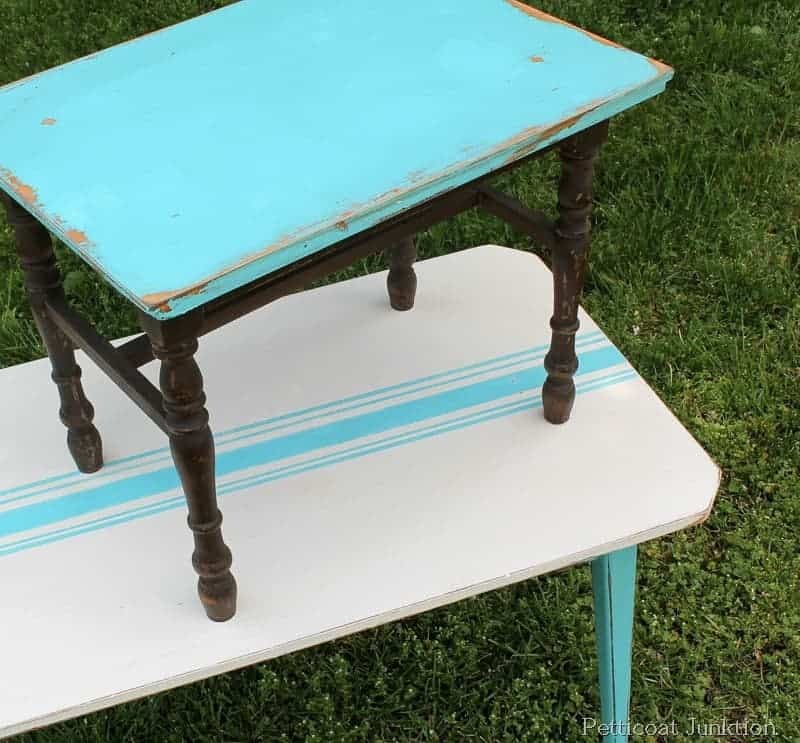 Painting grain sack stripes on furniture is super easy. Do you think that trend is over? I don’t really care. I like them and I don’t think grain sack stripes on furniture and home decor have lost their appeal yet. 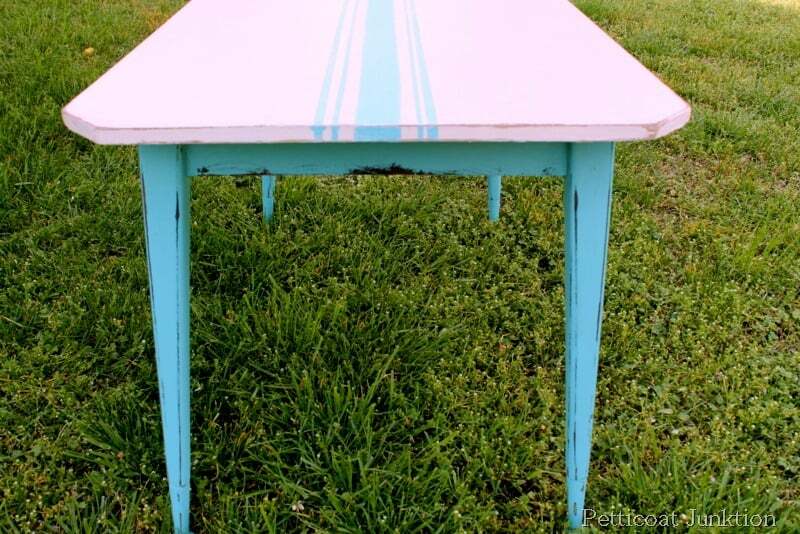 The JTS put a couple of tables together for me and I painted them. 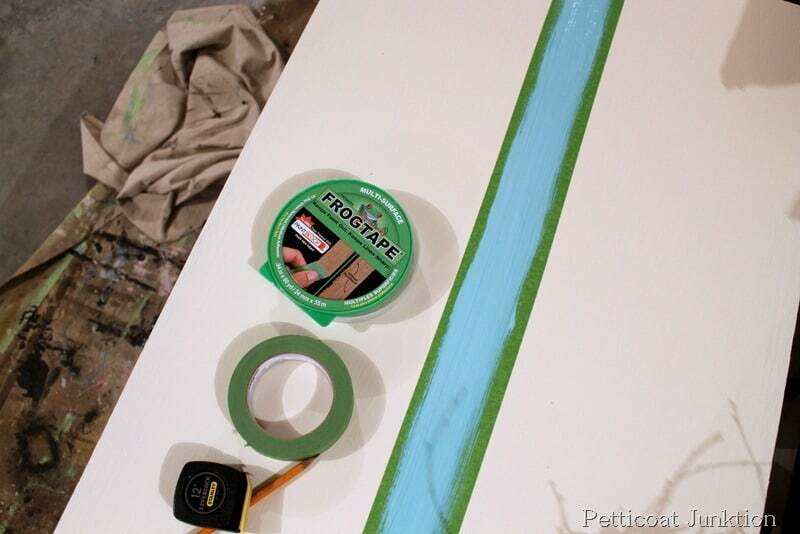 The color today is turquoise…..and white…..and wood finishes…..and grain sack stripes. First I’m going to talk about how we put the tables together. 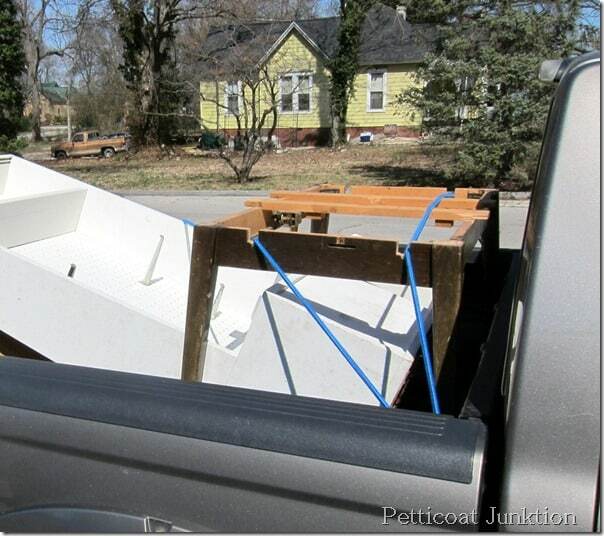 I bought the bench seat bottom (wood frame) at the Nashville Flea Market last month. I don’t remember the price but it had to be cheap for me to buy it. Maybe $5. 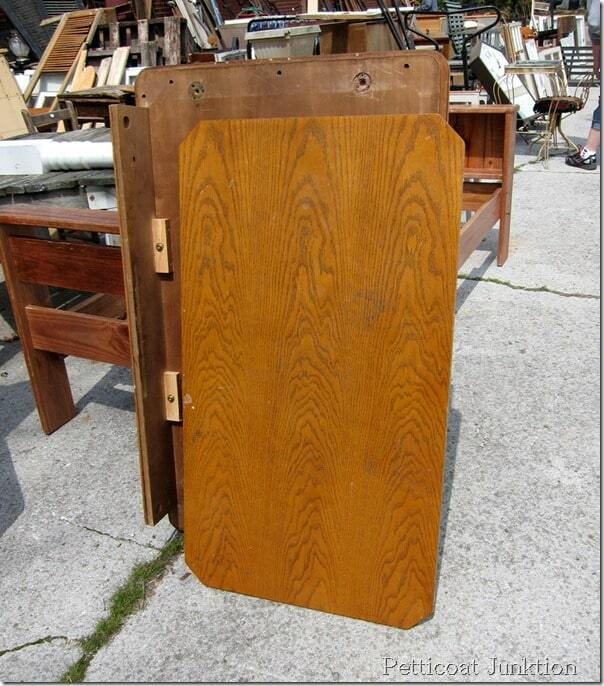 The cabinet door the JTS is removing the hardware from came from My Favorite Junk Shop. It’s been in the shop for a while. I knew it would come in handy one day and it set on top of the bench like they were made for each other. 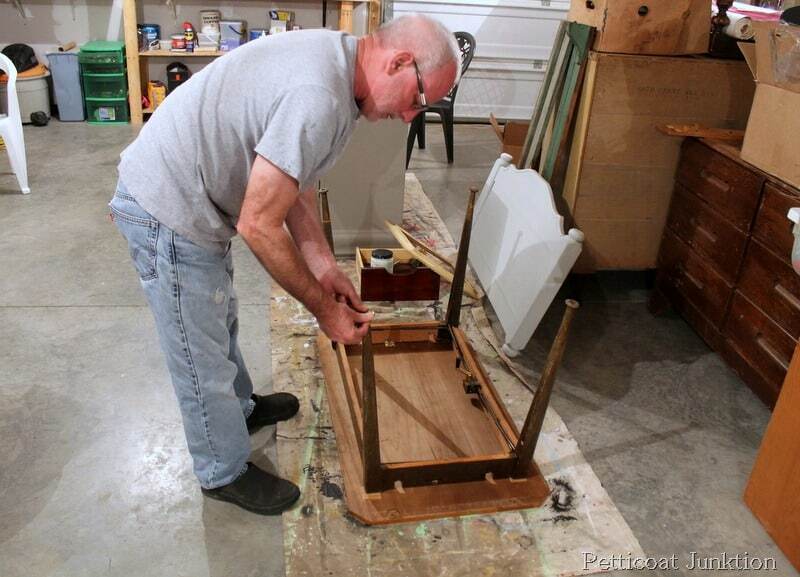 The bench base was a little wobbly so he added a little glue and strapped it together to dry. 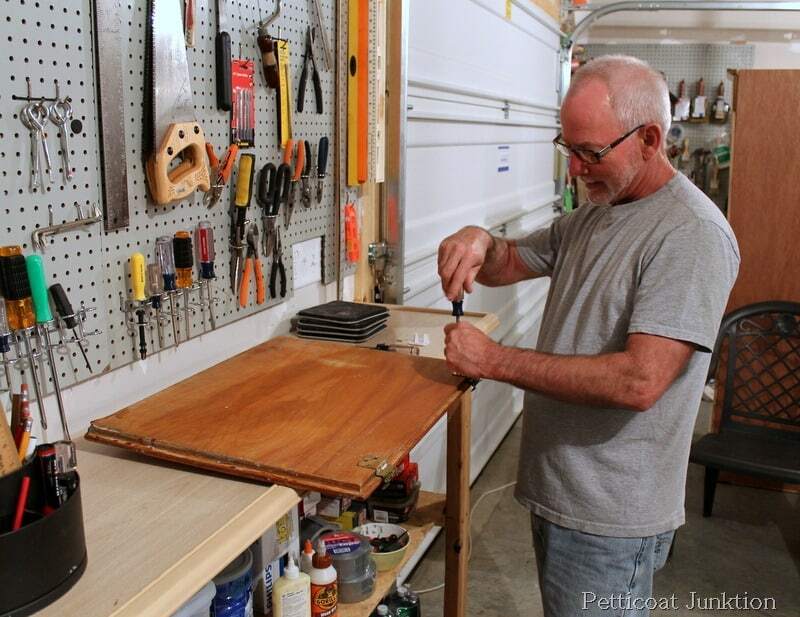 Then he attached the cabinet door to the bench base using screws. 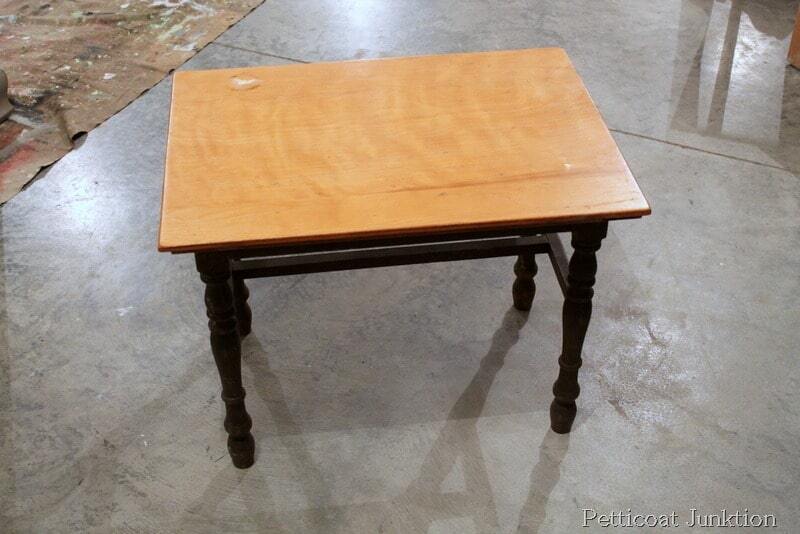 Ta-dah, new table waiting for paint… $5.00 for the base and $2.00 for the top for a total of $7. Nice for anyone on a budget like me. Now for table number 2. I found this table top at my favorite junk shop. As you can see I get a lot of my stuff from the junk shop. You can read about the junk shop here. 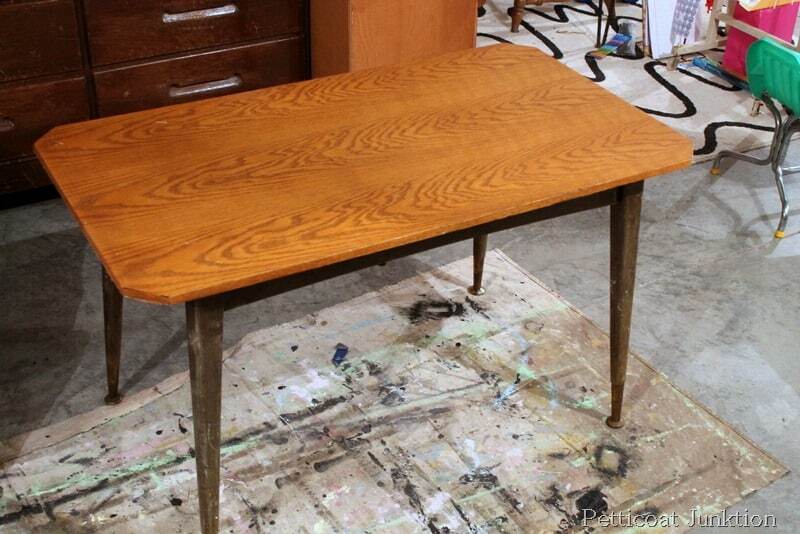 In the photo above you can see the table base from My Favorite Junk Shop shopping trip a couple of weeks ago. I buy odds and ends like the table base, cabinet door, and anything else I can use to make something new when I find things at a good price. Hubby attached the two pieces with stuff found in the hardware stash. One of the metal feet was missing and we found a part that would work in my junk stash and glued it on with E6000. A large stash of junk hardware really comes in handy. Those little feet are cute. $5.00 for table base and $3.00 for the top. Another table waiting to be painted, yay. I used to pass up odds and ends and pieces and parts when I was junk shopping but not anymore. If you get enough parts you can make a whole. 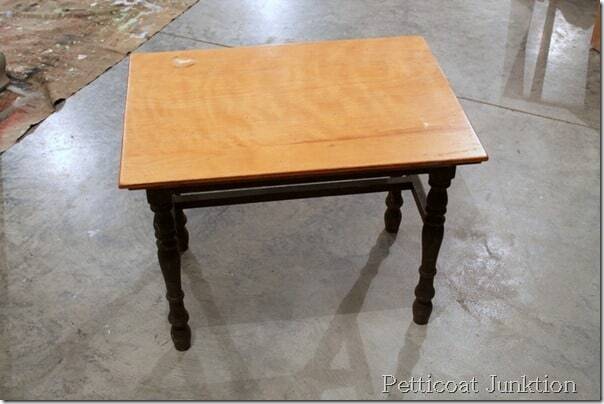 These are the two tables before….but not really. 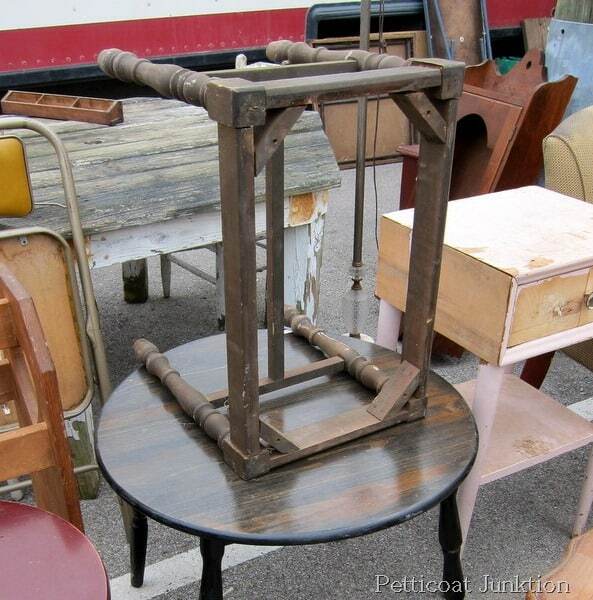 You need to catch up by reading Salvage Saturday, Putting The Pieces Together. They were put together from salvaged parts and pieces. I decided to try the grain sack table top look for the larger table. Her table has red stripes with a gray table base. 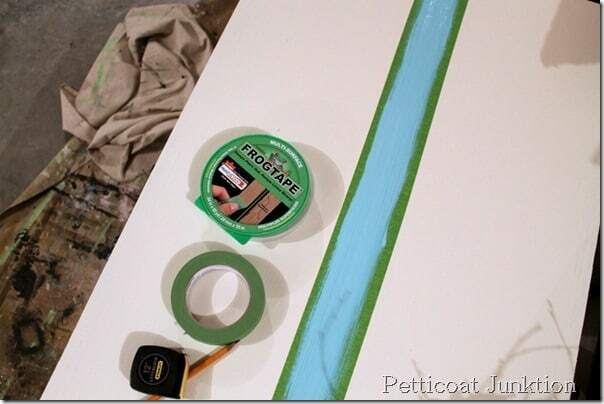 I chose turquoise and off-white for my project. 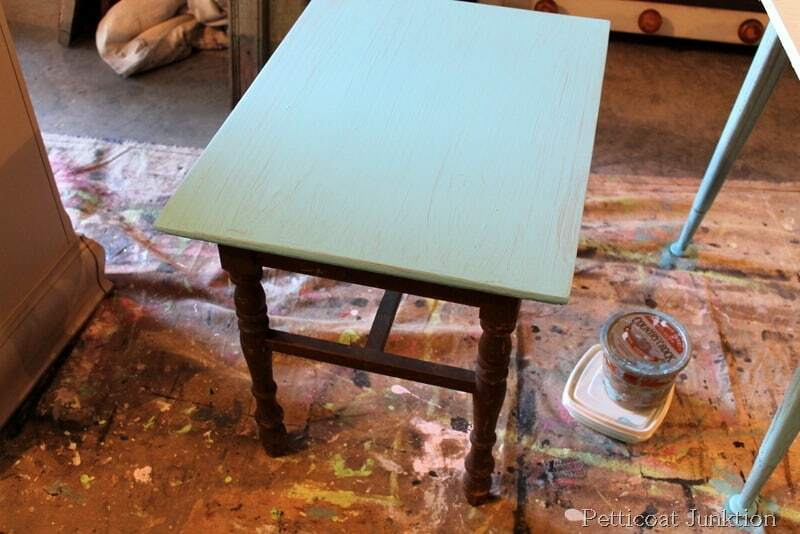 For the smaller table I painted the top turquoise and left the base as it was. I love the wood and curvature of the legs. 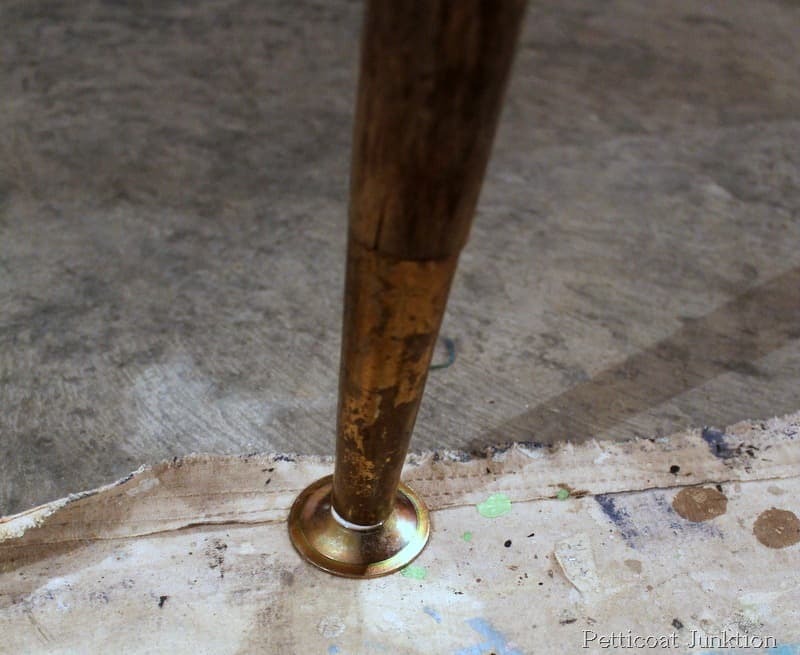 I measured to figure the center of the table then basically winged painting the stripes. It’s really hard getting 5 stripes exactly even and spaced right. I used Frog brand tape and didn’t have any bleed through. Love that! 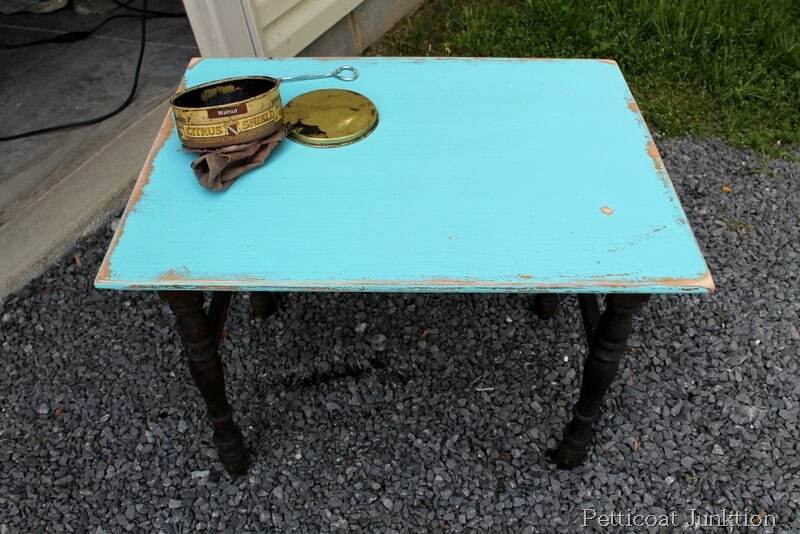 I did some distressing on the top of the smaller table and used a little dark wax for the finish. I also waxed the legs. 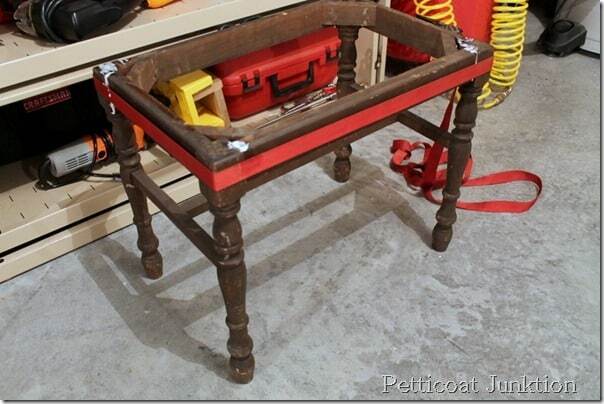 For my grain sack table top I distressed with an electric sander and put a very light coat of dark wax on the top and legs. Do you like the stripes? The after is so much better than the before isn’t it? I love the turquoise and white together…..crisp and clean. I love hearing from my readers, and I read all comments. love love love the grain sack stripes 🙂 great job! I stumbled on your site via Pinterest and love all the inspiration and tutorials. 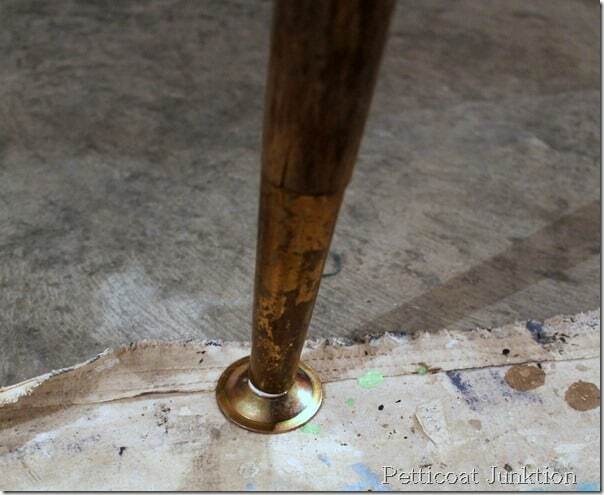 I have a table on my deck that I am going to experiment with. Thank you for the great ideas! 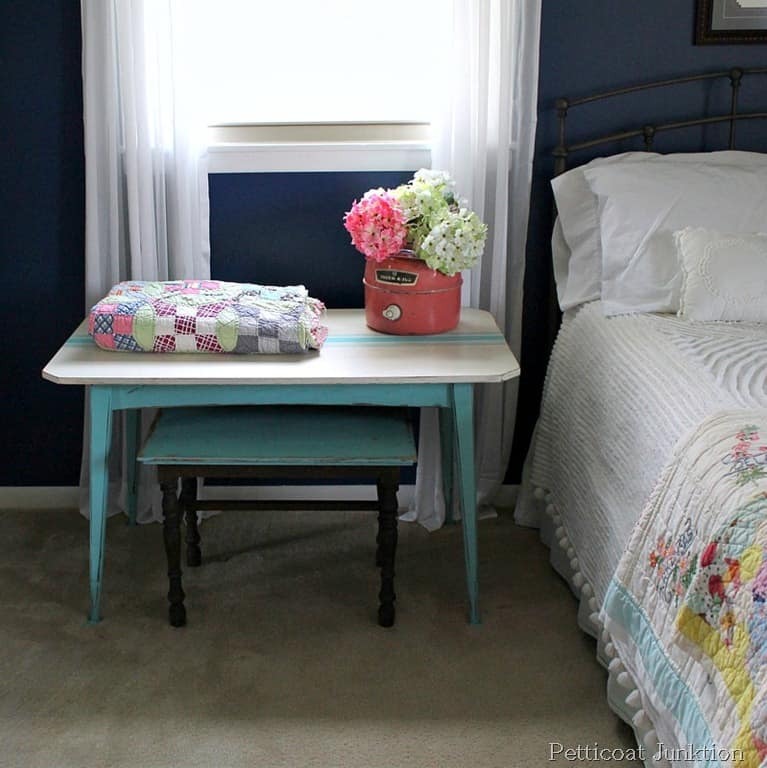 Love the quilts and chenille bedspread too! I love these colors! The tables came out so nice. Where do you get your wax from? It seems like my hardware stores are very lacking in the wax department. Nice table! Love the grain sack stripes! Oh, Kathy, I am in LOOOOVE with these two tables! Heck, I am in love with the whole room. 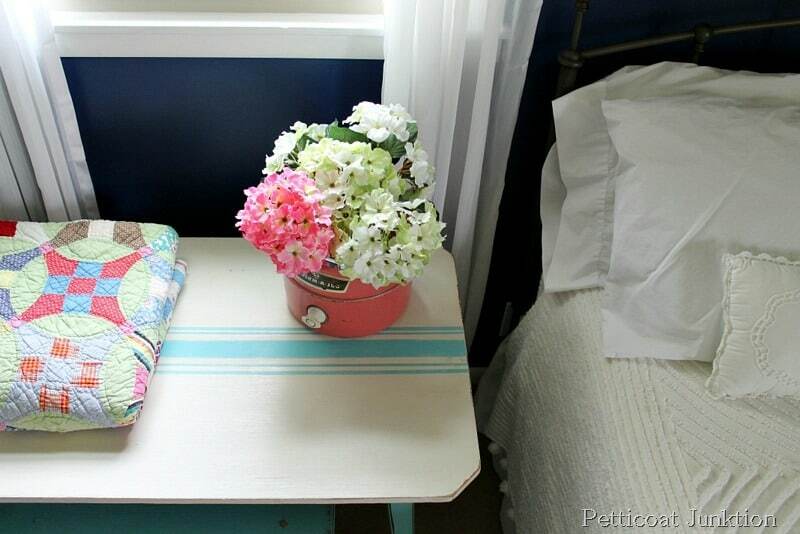 The vintage chenille, the vintage quilts, the great tables… Swoon!! I have a table in my craft room that I would love to paint up in the same turquoise grain sack motif. Would you mind if I did that? Of course I would share a link back to your blog and so on. Do you mind if I also share that last photo (with links) to show where my inspiration came from? I would really love it! Let me know! Thanks so much for being so inspiring and talented!! Angela, what a nice comment. You are welcome to share my picture and please share when you create your grain sack masterpiece! Kathy, if I lived closer that grain sack table would be coming to live with ME! I love it!! thanks Nic, wished you lived closer! did you have a good trip to Florida? In 10 days we have visited 8 states. Momma is tired and ready to be home. Should be later today. But we had a great time!! 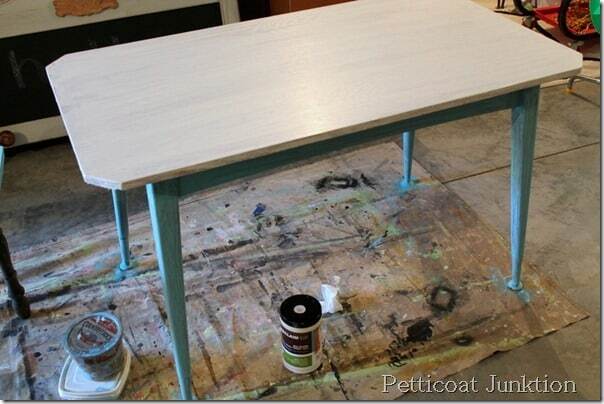 Have been thinking about your table and think I might attempt this with MMS yellow and chalk white. 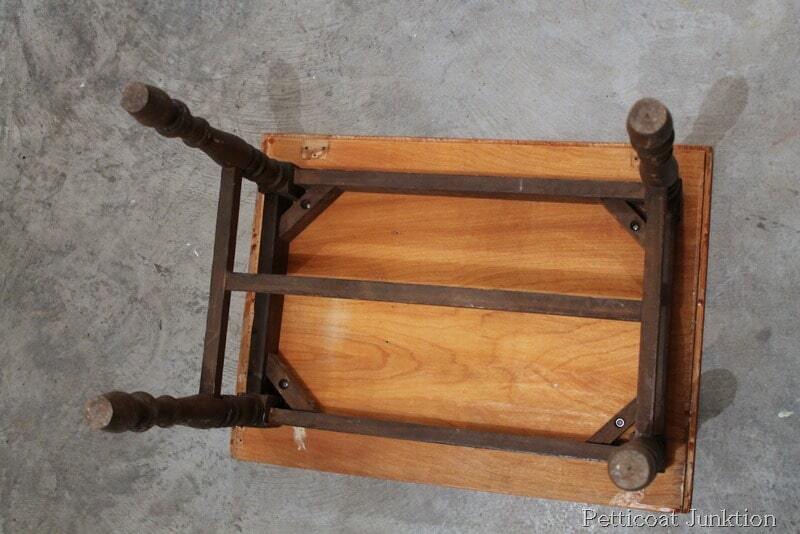 I have a little side table that needs a face lift. Will let you know. oh, the yellow and white sounds great together. I might have to steal that idea Hope you had a great trip! I love this, and yes, it did bring a smile to my face, love the room it’s in as well! Kim, that was my son’s bedroom at one time and he painted the walls deep royal blue. He’s going on 30 now and out of the house for years, but I still love the color and have redecorated around it through the years. 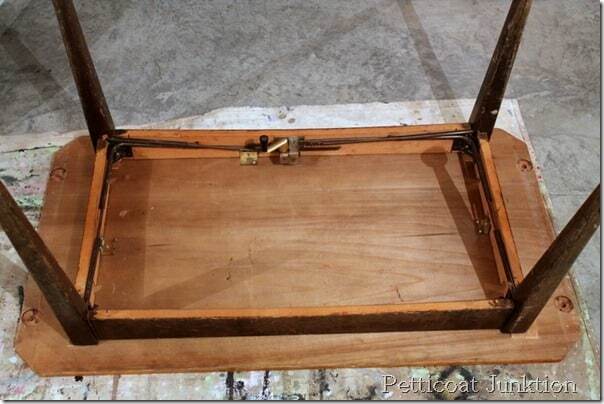 It is in need of a paint job! LOVE the stripe and the bench underneath! like the stripes. like the two together. good job. Linda, I can always count on you to comment. Please continue to visit because I love reading the comments.